Prehistoric reptiles, including dinosaurs, were the dominant animals for about 160 million years. These 160 million years is divided into two sections, called eras. Mesozoic Era (245 million to 65 million years ago). Each of these eras is divided up into sections called periods. Cambrian period (570 million years ago): The first fishes, corals, trilobites and shellfish appeared. Ordovician period (505 million years ago): The first Nautiloids appeared. Corals and trilobites were common. Silurian period (438 million years ago): The first land plants and giant sea scorpions called Eurypterids appeared. Devonian period (408 million years ago): The first amphibians, insects and spiders Appeared. Carboniferous period (360 million years ago): The first reptiles appeared. Great swamp forests covered the land. Permian period (286 million years ago): The first sail back reptiles such as Dimetrodon appeared. 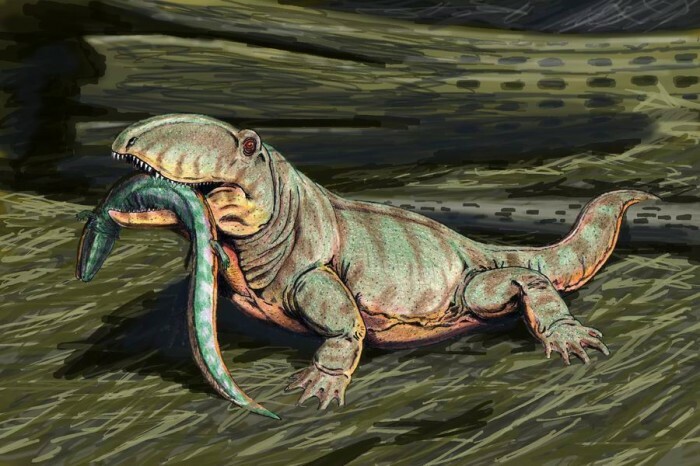 Triassic Period (245 million years ago): The first dinosaurs such as Coelophosis and Euskelosaurus, and mammals, turtles, crocodiles and frogs appeared. In the Triassic period, all the continents were joined together in one huge land mass. Climate was hot and dry but with rain seasons. The first tree ferns and coniferous trees were starting to Appear. Jurassic period (208 million years ago): The first birds Appeared (e.g. Archaeopteryx).Dinosaurs included Diplodocus, Stegosaurus, and Brachiosaurus. In the Jurassic period, the climate changed as the huge continent was breaking up. There were no forests of cycads, conifers and ginkgo, all plants that still exist today. Cretaceous period (144 million years ago): Dinosaurs during this time included Muttaburrasaurus, Quetzalcoatlus, Ankylosaurus. The dinosaurs died out towards the end of this period. 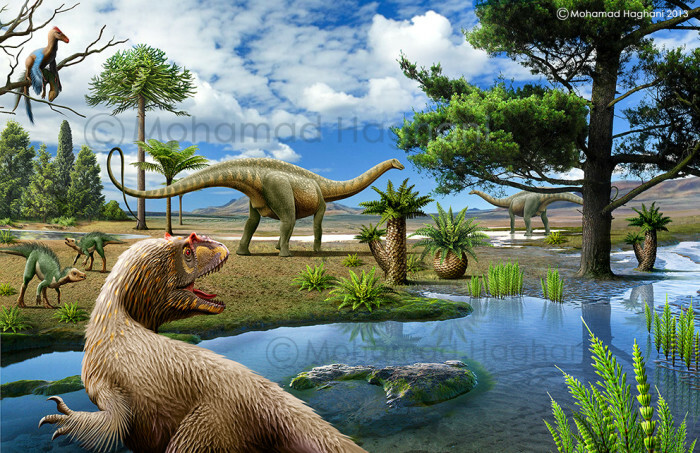 The first modern snakes and mammals appeared. In the Cretaceous period the continents had separated and each had its own flora and fauna. There were now flowering plants such as magnolias and water lilies. However, Australia and Antarctica were still joined together. Following the Mesozoic era was the Cenozoic era (65 million to 0 million years ago), during many different species of animals appeared. This era ended with the Great Ice Age and the appearance of the first humans.